Today was our last day in Antarctica. We have sailed all through the night and entered Whalers Bay at Deception Island, through Neptunes Bellows, a few minutes before 8:00. We were on the bridge as we approached and Robin pointed out the steaming shoreline – created by the geothermic heated hot water meeting the cold water of the sea. Again, a little history and geography lesson is in order – Deception Island’s collapsed volcanic cone (the caldera) provides one of the safest natural harbours in the world, despite periodic eruptions of the still active volcano. The beach is covered with old barrels, equipment, whale bones and other debris from the whaling and research periods. As mentioned above, steam can be seen rising from hot springs along the shoreline, and one of the first impressions of the island as we approached, was the strong sulfurous odor. Another interesting tidbit related to the volcano –only 57% of the island is covered by glaciers – most likely due to volcanic activity, while neighboring islands are almost 100% glaciated. The volcano last erupted in 1970. The first Zodiac was scheduled to go ashore at 8:30, and our group was set to disembark at 9:00. We had a nice hearty breakfast to keep us going, and were on land by 9:15. We walked both directions along the beach, and saw a few Chinstrap Penguins, and Cape Petrel. To us, the most interesting aspect of the island though, was the old whaling / research station. It operated from 1912 to 1931, and the remnants are surprisingly well preserved. The Island was also used briefly in 1944 as part of Operation Taberin, after which it was used as a British research facility until 1969 when it was destroyed by mud flow (triggered by volcanic eruption). The amount of equipment left on the beaches from the whaling days is simply staggering. It is impossible to imagine the number of animals that were slaughtered here and the resulting amount of oil that was processed – pictures show 6,000+ whale carcasses along the shore during the height of whaling activities. We have also been told by members of the Expedition Team, who have dived in this part of the world, that the number of whale bones that litter the ocean floor is remarkable – not in a good way. We were barely back on the ship, and headed to lunch, when we noticed that the ship was turning 180* from the direction it was headed. 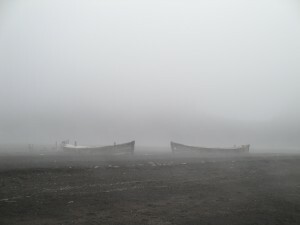 Conditions today were such that a landing at Baily Head (almost exactly on the opposite side of the caldera) on Deception Island would be possible in the afternoon. So, once again, and for the last time, we donned our cold weather gear and boots. This landing was a little unusual in that the waves were fairly strong on the beach, and as such, the Zodiacs landed with the back on the shore. Baily Head is home to the largest Chinstrap Penguin colony in the Antarctic with estimates of more than 100,000 breeding pairs. It was a rare opportunity for the Silver Explorer to make a landing here – the average is less than one time per year. Some of the expedition staff have never been ashore here, having been unable to leave the Zodiacs. From the moment we set foot ashore, the expedition was a huge success. 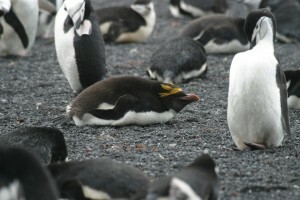 There was one lone Macaroni Penguin visible on the beach, amongst the thousands of Chinstraps and he was incredible. Macaroni may sound an odd name for a species of penguin, but once you see one, it all makes sense – the yellow tufted crest curls just like a macaroni pasta. This was our only sighting of a crested penguin during the trip and this was also remarkable in that we have observed five of the five possible Antarctic penguin species. The Emperor, of course, being the most elusive. The hatching season is a little further along here at Bailey’s Head, probably due to the geothermal effects on the Island. So, there were several chicks peeking their heads out and getting fed. They are only a day or two old, and still have their egg tooth (used to break through the egg) – they lose the tooth after 4-5 days. The number of penguins seen here is totally unbelievable; they continue as far as the eye can see, with penguins heading in all directions along their penguin highways, in a seemingly “organized” chaos. After the last guest was delivered back to the ship and all but one of the Zodiacs were hoisted aboard, all members of the expedition team returned to shore to allow those members having never landed here to do so, and get their own few minutes with the penguins. This evening the briefing and recap was scheduled for 6:30, as we had so much to cover. As part of the recap, Robin showed two video clips when the landing at Baily Head went very wrong (other ships – not Silversea!). It made all of us that much more thankful for the opportunity we had earlier today with such incredible sea conditions. 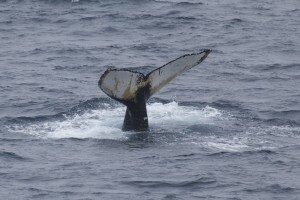 The recap wasn’t quite finished, when two humpback whales were spotted, and off we went to the bow for better viewing. Mark and I opted to observe from the bridge, with its nice big, open windows, and cozy space versus being outside in the cold and rain. We watched the whales for about thirty minutes, and saw a couple of deep dives – these are characterized by the tail fluke coming out of the water. They also played around on the surface, rolling over and slapping their flippers on the surface. It was awesome, and I don’t think any of the passengers wanted to leave, but eventually, the Captain put us back on our course north. How incredible it all sounds!